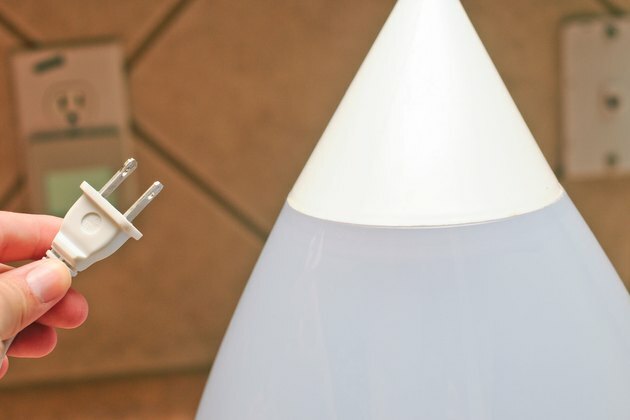 Humidifiers, such as the Crane Cool Mist models, add moisture back into the air, making them especially useful in warm, dry climates and during heating season. 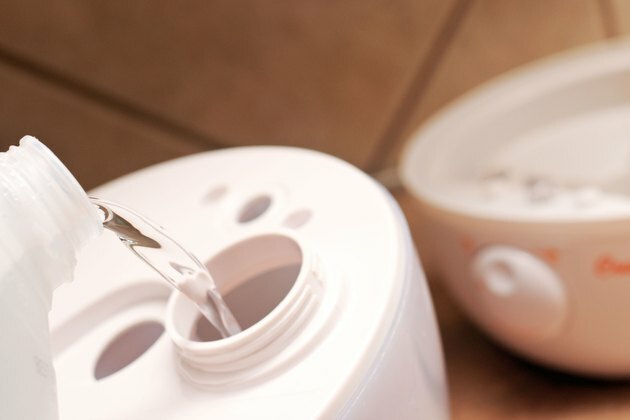 Despite their benefits, humidifiers can accumulate mineral deposits and promote the growth of microorganisms inside of the tank, including bacteria and mold. 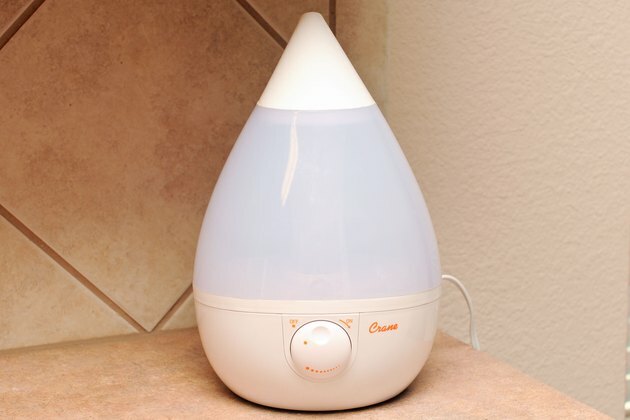 Weekly cleanings prevent this, whether you have a Crane Cool Mist Humidifier model that is a whimsical frog shape or one of the more adult-friendly drop or ultrasonic products. 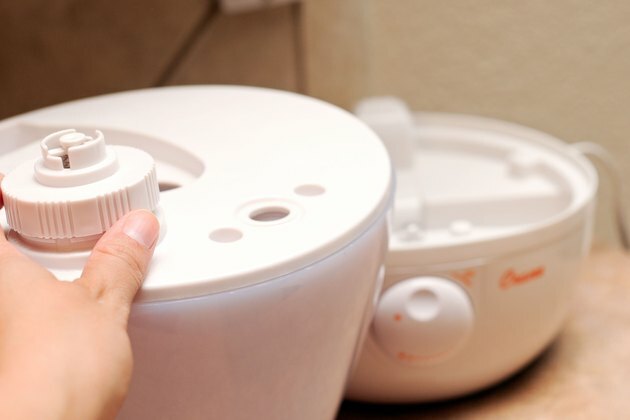 Refill the tank with clean distilled water and add 2 tbs. of distilled white vinegar. Screw the cap back on the tank. Shake the tank to mix the water and vinegar. Let the tank sit for 30 minutes. Then, shake the tank vigorously to dislodge buildup. 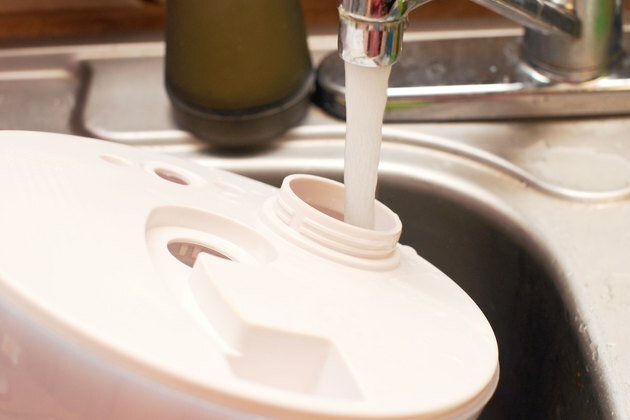 Uncap the tank, pour the water out and rinse the tank and cap thoroughly with cool water. 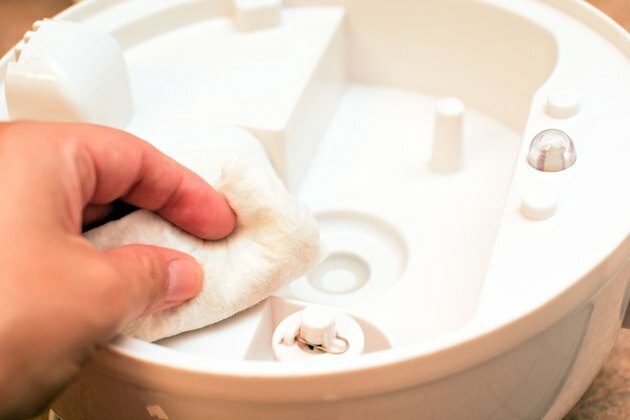 Wipe the inside and outside of the tank with a damp, lint-free microfiber cloth. Leave the tank open and let it air dry for one to two hours. 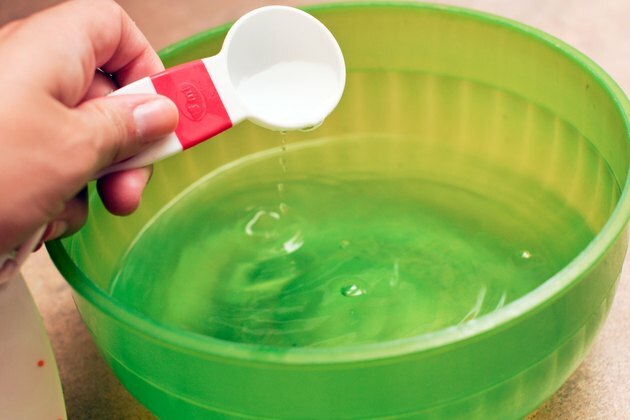 Fill the basin with water and 2 tbs. of white distilled vinegar. Let the basin sit and soak for 30 minutes. Empty the cleaning solution. Combine 2 tbs. of vinegar with 4 cups of water in a bowl. 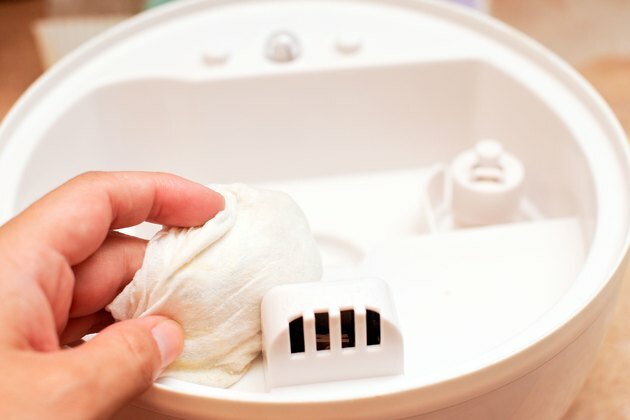 Dip a lint-free microfiber cloth into the solution and wipe the water basin down, taking care not to disrupt the water level sensor. Rinse the basin with a damp cloth until you can no longer smell the vinegar. 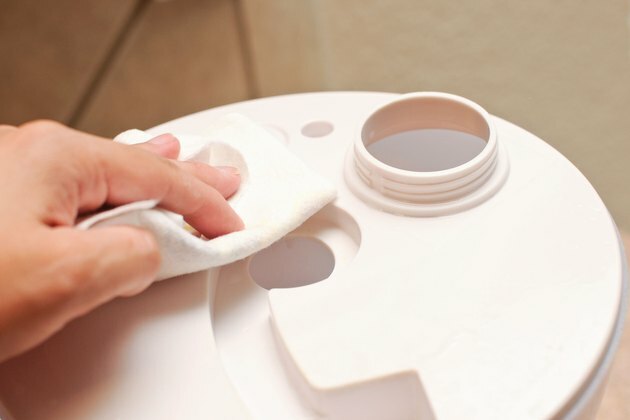 Wipe the water level sensor gently with a damp cloth. 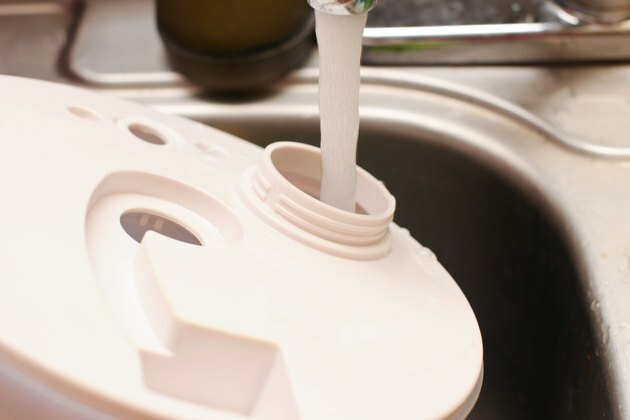 If your model has a float-style sensor, lift the tabbed plastic cap from the plastic pin and circular water float. Wipe the pieces and pin with a damp cloth and re-assemble. 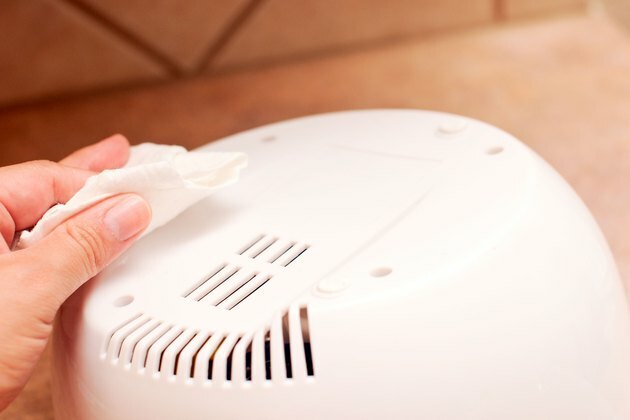 Clean the nebulizer in the water basin if present. Wipe it gently with a cloth dampened with the vinegar solution until you've removed all scale buildup. Dry thoroughly with a cloth. Clean the exterior of the base and feet with a dry cloth.